As we soon enter the last stretch of our beloved series let's take a look at what I believe are the most important episodes. Actually, I tweeted this list to executive producer, Joel Wyman, months ago, and shortly after he gave me a one word reply-"Perfect." and this list was not necessarily easy to compile. I am sure there are many fans reading this that will have a list different from mine. Every day for the next 8 days I will post an episode here with a review and a comment on why I believe this episode is so important to the series. For those of you fairly new to Fringe think of this as a sort of 'Cliff Notes' for Fringe. Every television series needs a starting point. An opportunity for us to meet the main characters and get a sense of what the show will be about. And in a show that has to date essentially 5 different starting points, ie. the season premieres of all 5 Seasons, it is especially important to have a well-written point of origin. And just as Walter wrapped one edge of the paper around to meet the other edge in his demonstration to Peter and Olivia of how Dr. Peck bent time in 'White Tulip,' will the end of the Fringe series possibly wrap back around to this pilot episode? Only time will tell! I think this is why I love this show so much. A lot of times we find ourselves at the beginning. And we have even in Season 5. Peter used the flesh eating toxin from the Pilot to destroy the Observers in the building. Can't wait to find out how it ends. Or maybe not... don't really want it to end. 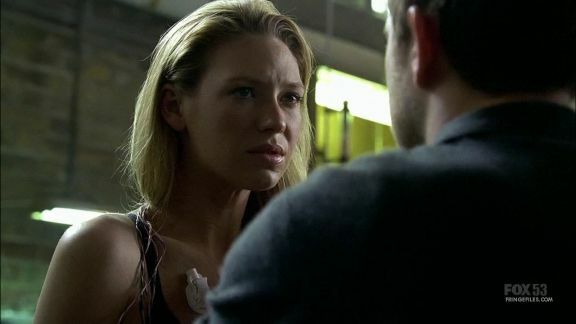 I forgot to mention that to get the most out of Fringe one really should go back and watch the pilot at least after each season finale. I rewatch it around the middle of each new season, to see what new information it reveals about the current season-in this case, Season 5, as cortexifan has so wisely pointed out.